Over the next couple of years to 2020 Seat plans to release a new car every six months, with first arrivals Tarraco and Ateca followed by Seat’s first hybrid and EV. In 2019, the new generation Seat Leon will be available in dealerships with two variants, the five-door model and the ST family sized version. The following year will also see a hybrid version of the Leon that will feature a range of at least 31 miles (50km). 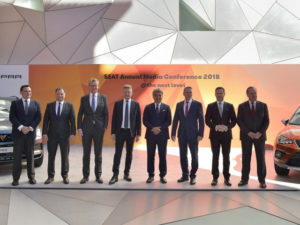 Seat’s first electric vehicle will be introduced in 2020, based on Volkswagen Group’s MEB platform. The EV will be a so-called CUV (Crossover Utility Vehicle) and the first of its type in the Seat lineup. A range of more than 300 miles (500km) is expected, the company added. The car will likely follow the lead of the Volkswagen I.D. range that shares the platform.